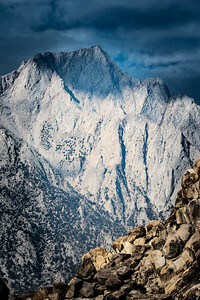 This stunning Eastern Sierras rise above the foreground rocks near Lone Pine off the 395 on the way to Mammoth Mountain. Although this looks like snow, that is actually the color of the rock. Canon 7D Mk II, Tamron 150-600 mm @150 mm, 1/160 at f/6.3. 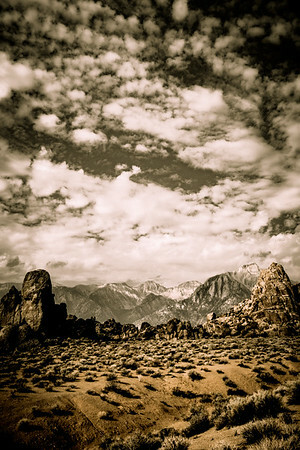 Near Movie Road, off the 395, Lone Pine, California. 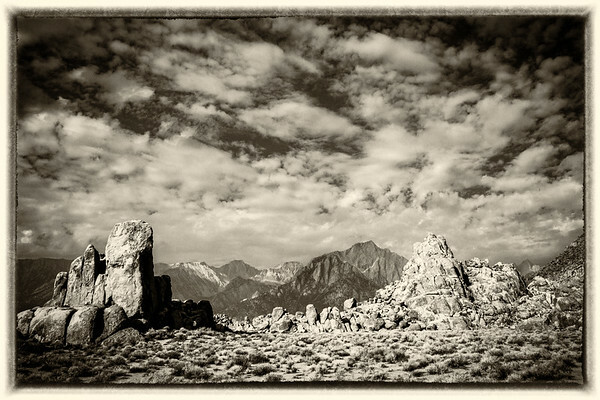 Sky for miles above the Eastern Sierras, framed by two rock formations near Lone Pine in the Alabama Hills. 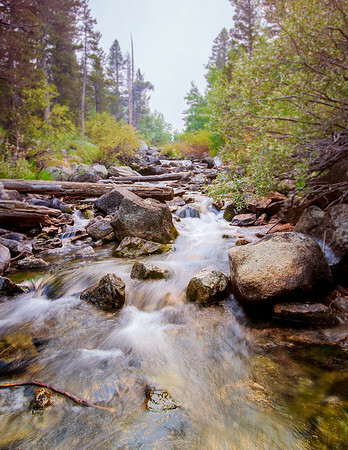 This beautiful little stream is located in Rock Creek Canyon off the 395 near Mammoth. 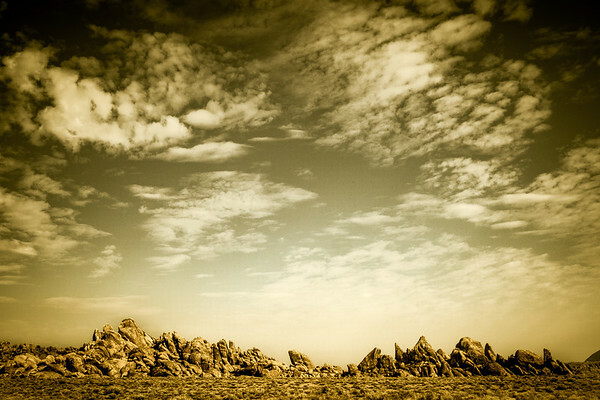 Canon 7D Mk II, Tamron SP 15-30, 15mm @ f/20, .5 sec, ND filter. 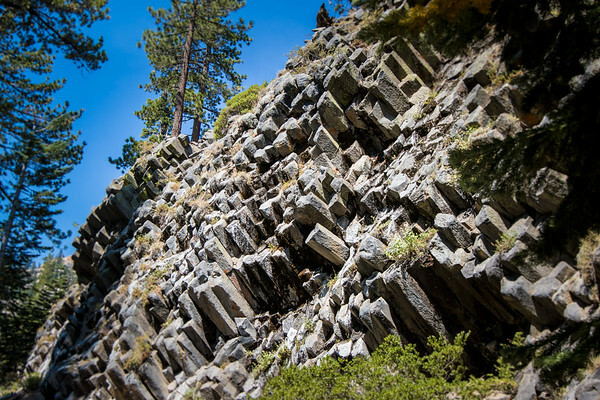 Volcanic magma that cools and cracks into hexagonal shapes created this natural formation. This is only seen in a few places on earth including the Giant's Causway in Northern Ireland. 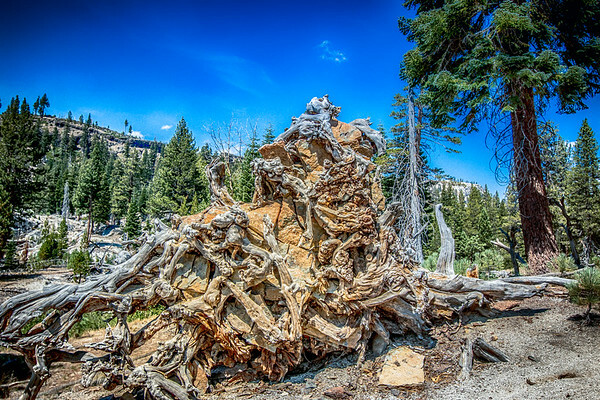 This eye-catching tree stump was on our hike to Rainbow Falls. I'm not generally a big fan of HDR, but thought that this particular image lends itself to that kind of post processing. 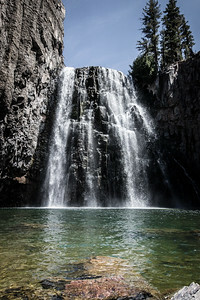 After a long hot hike, the chilly water of Rainbow Falls (Ansel Adams Wilderness Area near Mammoth) was a welcom relief. There was a surprising amount of water coming down the falls despite California's severe drought. Tree stumps remain, new trees growing in the area burned by the 2010 Rainbow Fire. 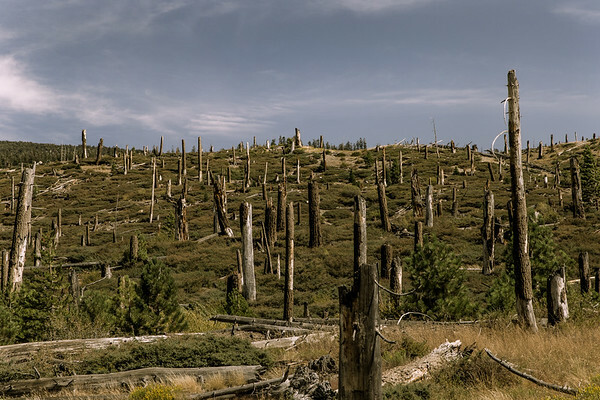 On the hike to Rainbow Falls, you pass through an eerie patch where nearly all the trees look like stumps. The new underbrush and young tress have already started to grow back. 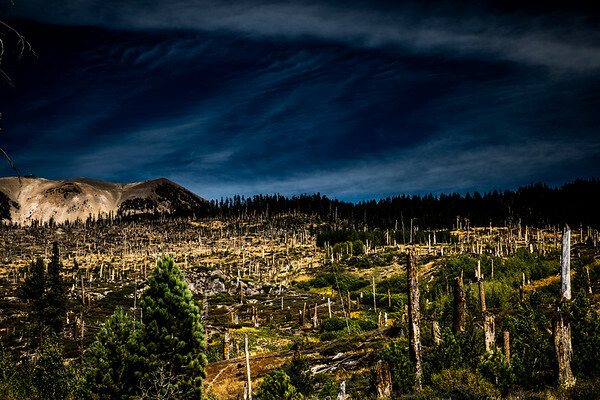 An eerie sight as trees are damaged or destroyed for miles in the Rainbow Fire area near Rainbow Falls in Mammoth. Still, life returns with new trees and undergrowth. 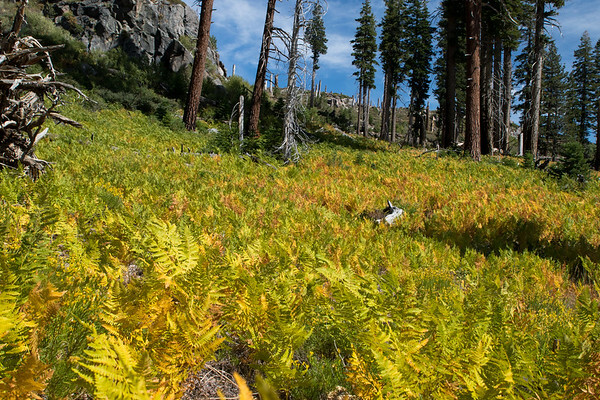 Colorful ferns continue to thrive in the area burned by the Rainbow Falls fire near Mammoth, CA. 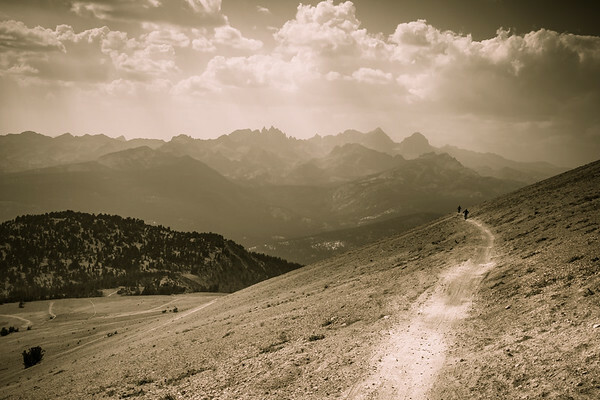 California, Oregon and Washington have had a brutal drought and nasty fire season in 2015. 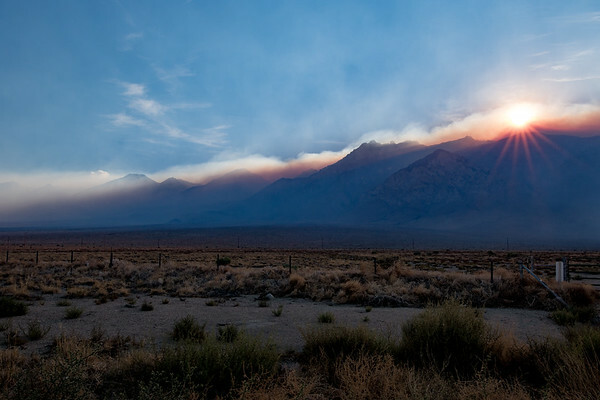 Returning from Mammoth, driving south along the 395, the smoke from a fire over 100 miles away came over the top of the mountains at sunset.